Will being a bear save you money as well as make you sound clever? BEARS sound clever; bulls make money. This piece of financial acumen, imparted by a trader to a colleague, is hard to beat for brevity. It also makes a good point. There is something about market pessimism that endows bears with an aura of wisdom that is not always deserved. The cautious sound clever because they appear to have weighed the odds. Optimists seem heedless by comparison. Yet it is only by taking on risk that investors can hope to make money. So it is telling that even bulls are now sounding cautious. The economy and stockmarket in America have had a good run, after all. The expansion, which started in 2009, is now the second-longest on record. Unemployment is low. The Federal Reserve is hawkish. This mix tends to kill a bull market sooner rather than later. The question is how much further stocks can rise. Is there still time for bulls to make money? Or will being a bear save you money as well as make you sound clever? In this debate, each side has a distinctive way of looking at things. Put crudely, the pessimists believe that markets drive the economy. In their view, near-zero interest rates and quantitative easing, or QE, pushed investors out of government bonds and into risky assets. Now that such policies are reversing, stocks and corporate bonds are vulnerable—and so is the economy. The optimists, by contrast, believe that markets are led by the economy. Only when it shows weakness, and profits slump, is it time to get out. At the start of 2018 the optimists had the better case. Then, for a while, things looked more balanced, with the pattern of returns providing ammunition for both sides (see chart). Now, though the most recent data favour the optimists, they seem to be losing conviction. The strength of the bearish case suggests that, when the market turns, it will be dramatic. Consider the pessimists’ case. If markets lead the economy, notes Matt King of Citigroup, trouble can strike suddenly. In this view, the sell-off in emerging markets and jitters in the rich world, such as the sudden drop in American stocks in February and turbulence in Italy in May, have a common cause. For David Bowers, of Absolute Strategy Research, they indicate a “rolling liquidity crisis” caused by tighter Fed policy. He sees the steep falls in the shares of big banks in Europe and China as another worrying sign. Does the body rule the mind? The optimists see things differently. Though the broad American stockmarket has been flattish, the Nasdaq index of technology stocks and the Russell 2000 index of small firms have done well. That is to be expected in a maturing business cycle. Bull markets tend to narrow with age, as investors double down on stocks that have served them well. Late-cycle economies also favour small, left-behind stocks. Shares in Europe and Japan have fared badly because of a temporary loss of economic momentum there. Emerging markets have suffered, but that reflects local troubles: botched reforms in Argentina; fiscal laxity in Brazil; inflation in Turkey. Moreover, strong jobs growth in America last month was more of a spur to the labour supply than to wage inflation. Europe’s economy is perking up. Trusted signs of financial distress are absent. The yield curve has an upward slope. In the past, when the gap between short-term and long-term rates has turned negative (that is, the yield curve has “inverted”), recession has often followed. Another signal, says Ed Keon of QMA, a quantitative equity manager, is a widening spread in corporate-bond yields over Treasuries. But that light is not flashing red either. Even so, the bulls are becoming less bullish. In part this is because they worry that Donald Trump’s trade spat could all too easily develop into a damaging trade war. (The boom in the shares of small, less globalised firms owes something to such fears.) Concerns are growing that the Fed might trip up. It has no guiding example of reversing QE and quitting a zero-interest-rate policy. Tax cuts in America complicate the Fed’s task. Higher barriers to trade will add to inflation and hurt GDP, but to an extent that is hard to fathom. Can the optimists and pessimists be reconciled? 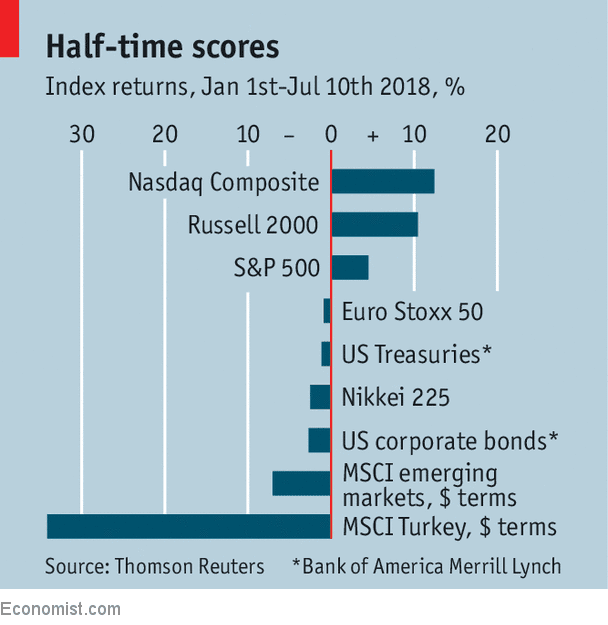 A minor irony is that both tend to favour American assets—the bulls because they reckon a booming economy will keep delivering fast-growing profits; the bears because America is where capital goes when investors are scared. There may well be a final upward leg to the bull market in stocks. The worry is that the bears will also be proved very right, very suddenly. If such worries are borne out, it will be a lot harder to pick the bottom of the bear market than it was to pick the top of the bull market.